Maxine is a fairly modern German variety and it is well adapted to growing in the northeast. Maxine is milled into bread flour. With very good baking properties, the flour is used by bakers for all types of leavened, unleavened & sourdough baked goods. Bread, made with Weatherbury’s Bread Flour, ground from Maxine wheat, has been called “life affirming” by eater. com. In 2018, Maxine Wheat was grown in Independence Township on 5.7 acres on the farm established by Robert Leggett in 1815. Leggett had holdings totally 585 acres in the area and raised 1000 sheep. In addition to being a farmer, he was a breeder and dealer of 1st class Spanish sheep (Merino). Today the farm still raises sheep. Weatherbury Farm transitioned this land from conventional in 2013; it was certified organic in 2015. The Maxine Wheat was planted on October 19 & 20, 2017. Clover was frost seeded into the grain on April 11, 2018. 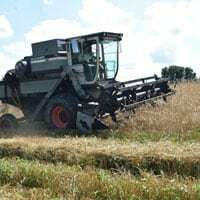 The wheat was harvested on July 3, 2018. At the 2018 Washington County Fair, the Maxine wheat sheaf won third place and Maxine grains also won third place. 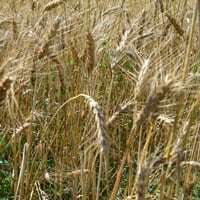 More information on Maxine Wheat and other grains is on the grains we grow page. To read more about bread flour made with Maxine Wheat, please visit our products page. Maxine bread flour can be ordered on our order page. 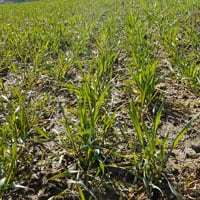 Maxine Wheat Field : Look closely and you can see the frost-seeded clover in the undergrowth.